Babcock and Wilcox boiler is a type of water tube boiler designed by an American firm Babcock & Wilcox. This single drum boiler used when the pressure above 10 bar and capacity of more than 7000kg of stem per hour is required. These are designed to stationary as well as marine purpose. Babcock and Wilcox boiler has one horizontal drum mounted on the top of the structure and series of inclined water tube below the drum. The angle of inclination of water tube is about 15°. Infront each tube a hand hole is provided for cleaning and inspection of tubes. The water tubes are connected to each end of drum through uptake header and down take header. The furnace is placed just below the uptake header. Baffle plates are provided between tubes to deflect and direct hot gases so that flue gases make passes over tubes for three times before it goes to chimney through smoke chamber. The dampers provided at the inlet of chimney to regulate the draught. The antipriming valve provided at the inlet of superheat tube filters the water content in the steam. The entire boiler except furnace is hung by metallic sling or wrought iron girders, which enables free expansion and contraction of drum and water tubes during the thermal cycle. 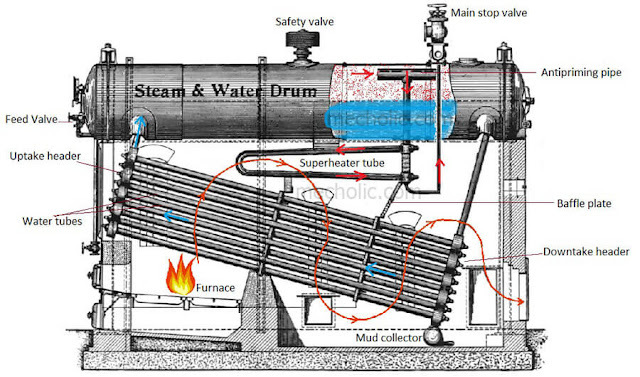 Mud collector is at the lowest point of the boiler, it helps remove mud particles. Brickwork encloses all the unit. The lower half of boiler drum is filled with water by feed valve. This water enters the water tubes through the down take header. Fuel burns inside the furnace and flue gases rise upward toward the water tube. Baffle plate makes sure the flue gases pass over the water tubes three times. As flue gas passes over the water tubes it exchanges heat with water through the tube walls. The heated water then flows to uptake header side. The hot water and steam then rises and enters to boiler drum. The circulation of water inside the tube is maintained by the natural convection. The steam is then escaping from water and collected at the top half of the drum, and water is collected at the bottom half of the drum. The water then again flows to the water tube thereby completes its cycle of circulation. The collected steam then flow to the superheat tube through antipriming pipe. The function of antipriming pipe is to filter the water content in the steam and allow the dry steam to enter to superheat tube. As steam pass through antipriming pipe, the water get condensed and fall back to the drum. The super-heat tube is exposed to the flue gas as shown in figure and the steam inside the tube gets superheated. The super-heated steam is then finally taken out through the main stop valve and transferred to the engine when it required. The flue gases give up its heat to water when it passes over the tube and finally escaped to the chimney.